My name is Daniel Hutcheson and I operate my business out of my home at 165 Trivett Drive. I have lived in Portland for about 20 years and have been repairing computers for about 18 years. I spent 10 years working at Unipres in Portland while attending Volunteer State Community College in the evenings. After 5 years I graduated with an Associates of Applied Science Degree in Computer Information Systems. 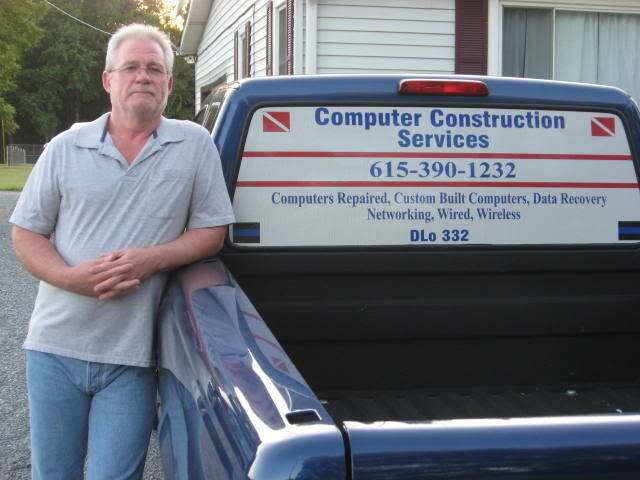 Currently, I work full-time repairing computers and spending my days meeting some of the nicest people in Sumner County. People frequently ask me about the emblems on the back of my truck. The two red flags at the top corners are “diver down” emblems– my hobby is scuba diving. The two blue stickers in the lower corners are “Thin Blue Line” emblems to show support for law enforcement. The “DLo 332” is in memoriam for a friend who served on the Gallatin Police Department until cancer took his life- Officer David Lo.